Digital illustration of yersinia pestis, the bacteria that causes the Plague. "Today, modern antibiotics are effective in treating plague," according to the Centers for Disease Control. A stew of bacteria constantly sloshes around in our guts. Most of it is supposed to be there, helping to digest food and absorb nutrients. There are harmful bacteria as well that can cause infections, in the gut and all over the body. Before the use of antibiotics became widespread in the 1940s, maladies such as a sore throat or even a small cut that became infected could wind up causing death. Antibiotics were (and still are) miracle drugs, but biology adapts, and in the 87 years since Alexander Fleming discovered penicillin, bacteria have continuously evolved, developing new defenses against attack. In fact, by 1946, 18 years after Fleming's discovery, an estimated 14 percent of one particular bacterial strain was already resistant to penicillin. Since then, the dance has continued: scientists identified more antibiotics, and bacteria continued to evolve. But now, thanks to what some experts call unethical use of antibiotics in humans and animals, the multitude of varieties of bacteria may be outpacing our efforts to control them. Time may be running out for the world's defenses against bacterial infections. In 2014, the World Health Organization released its first report on the worldwide threat of antibiotic-resistant bacteria, saying that without a coordinated plan of action, we are headed for a post-antibiotic era. For some people, that era is already here, says Dr. Guy Palmer, Regents Professor of Pathology and Infectious Diseases and the Senior Director of Global Health at Washington State University. According to a 2013 report from the Centers for Disease Control, 2 million people become infected with antibiotic-resistant bacteria every year, and at least 23,000 die from the infections. "Antibiotics are an amazing part of medical history," Palmer says. "But resistance to them by bacteria is also a fact. It's inevitable, but the speed with which it occurs could be preventable." Consider the impact of a "post-antibiotic era" on health care as we know it: Procedures that define the heights of medical advances — such as bone-marrow transplants, cardiac bypasses and joint replacements — will become much riskier, possibly too risky to attempt; chemotherapy will become a challenge, as patients with weakened immune systems won't be able to count on protection against infection; and people with common illnesses ranging from strep throat to gonorrhea to a urinary tract infection may no longer be able to go to the doctor, get a prescription and walk out confidently, assuming their symptoms will soon be gone. "Health care in the 21st century is built on the back of antibiotics," says Dr. Scott Weissman, assistant professor at Seattle Children's Hospital and the medical director for the Antimicrobial Stewardship Program. "Antibiotic resistance has changed the way we manage otherwise healthy people with infections, and is making decisions that were once routine much more difficult." Fleming won the Nobel Prize in 1945 for his groundbreaking discovery, but he emphasized that misuse of the drug would allow bacteria to mutate, rendering penicillin ineffective. At his Nobel lecture, he gave the example of a man with strep throat who didn't take enough penicillin — he took a course of medicine that killed some, but not all, of the insidious bacteria. The remaining bugs developed defenses against penicillin and passed those traits to their descendants. The man infected his wife, and she died from the infection. "If you use penicillin, use enough," Fleming said at the time. Resistance is hastened when antibiotics are not prescribed correctly — in the right amount, for the right amount of time or for the right infection. In those cases, the resistant bacteria survive and can begin to multiply — sometimes at the rate of a new generation every 15 to 20 minutes — passing along their defense mechanisms and quickly creating an army of superbugs. With all the evidence of increasing antibiotic resistance, it would seem that antibiotic prescription would be taken exceptionally seriously. That isn't always the case. "It comes down to physicians being anxious about a patient because they're uncertain about a diagnosis, or maybe the patient is expecting antibiotics and the physician wants to please them as a customer," Weissman says. In fact, the Centers for Disease Control estimates that up to a whopping 50 percent of antibiotics in hospitals are not "optimally prescribed." It's not always easy to determine the best course of action in patients whose lives, and illnesses, are playing out in real time. For example, it might seem simple to advocate using antibiotics in a life-or-death situation, but it's much more challenging to determine the best course of action when things are less obvious; occasions in which a physician is unsure of the diagnosis and opts to first protect the patient by using a powerful, broad-spectrum antibiotic, rather than waiting to choose a more targeted antibiotic with a smaller spectrum of destruction. Palmer says there is very little quantitative data surrounding this discussion, a hole his team of researchers at Washington State University is hoping to fill. 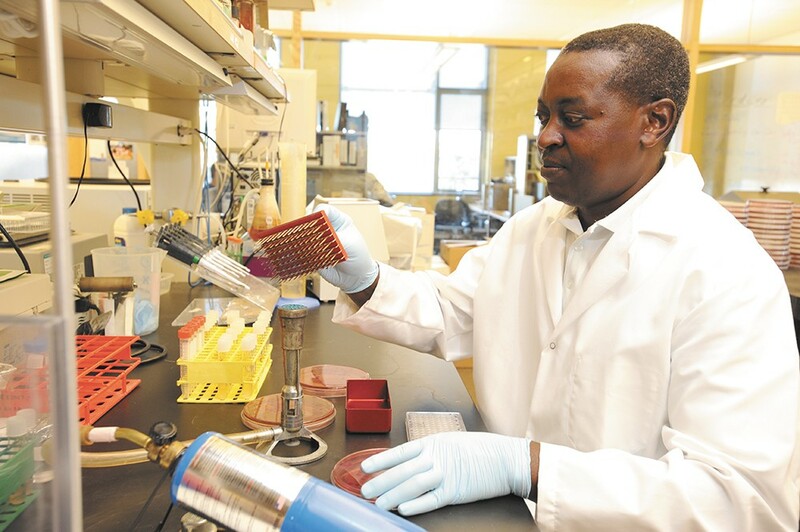 WSU photo, Henry Moore Jr.
Deo Mshanga tests samples for antibiotic resistance at a Washington State University lab. Hospitals throughout the state, including in Spokane, voluntarily track a number of bacteria, according to Carol Wagner, senior vice president of patient safety with the Washington State Hospital Association. There are two types of antibiotic resistant bacteria that state law requires care centers, labs and health care providers to report. The first is Vancomycin-resistant Staphylococcus aureus (VRSA). The second is a particularly virulent group of superbugs known as carbapenem-resistant Enterobacteriaceae (CRE). This group releases potent enzymes that destroy the very antibiotics sent to attack them, rendering what Weissman calls "the most powerful antibiotic in the history of mankind" powerless. The bacteria can wreak havoc, causing a wide range of infections, from the urinary tract to the bloodstream to the lungs. According to the CDC, the mortality rate for these kinds of infections is 40 to 50 percent. What is Washington state doing? The Washington State Department of Health has recognized Palmer's and others' claims that antibiotic resistance is not a one-dimensional issue. To that end, the department has joined with 10 other groups of stakeholders, including universities and state health departments, to combat the issue. It's known as the "One Health" approach. "The approach means people who've never talked to each other are talking now," says Dr. Marisa D'Angeli, medical epidemiologist for the Department of Health. "That's a really important part of tackling this problem." D'Angeli points to a push for the collection of bacterial resistance data in humans, animals and the environment. Once researchers have the data, they'll have a better understanding of what resistance exists in the state, and how it's changed over time. Although bacterial adaptation is inevitable, we do have control over how quickly it happens, Palmer says. Antibiotic stewardship programs like the ones throughout hospitals in Spokane are key examples of how to gain control. As a clinical pharmacist at Providence Sacred Heart Medical Center, Mariesa Durrant's job is to constantly monitor antibiotic use throughout the hospital. That means tracking which antibiotics patients are given, how much they're given and for what amount of time. It also means re-evaluating whether the original prescription should be changed. 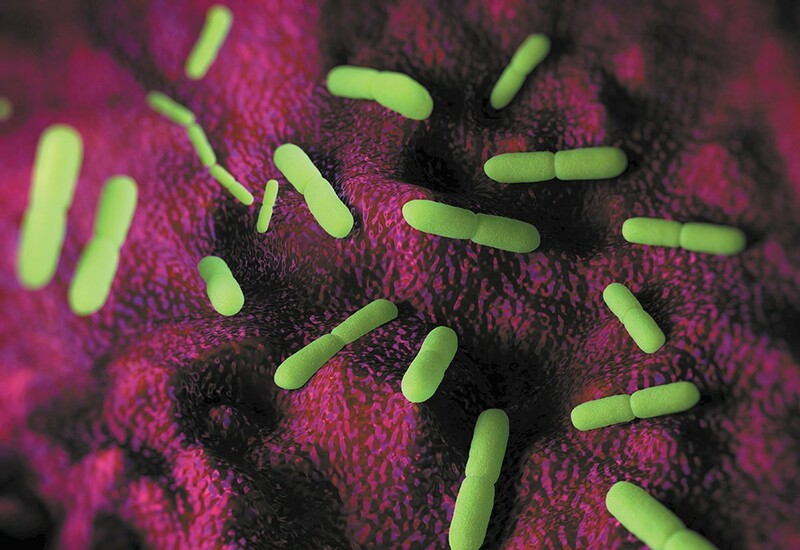 New antibiotics on the horizon? Researchers at Northeastern University in Boston discovered a new antibiotic without any detectable resistance earlier this year. The discovery marks the first major revolution in antibiotic resistance in decades, though the drug, teixobactin, has only been tested on mice. Human tests are at least two years away, and the drug is another five or six years from market. Despite the breakthrough, the wider scene of antibiotic development isn't booming. According to the Washington State Department of Health, new antibiotic approvals by the FDA have declined significantly since the 1980s, although two new antibiotics were approved this year. It's an expensive and time-consuming process, says Dr. Guy Palmer, Regents Professor of Pathology and Infectious Disease and Senior Director of Global Health at WSU. For pharmaceutical companies, the expense often doesn't outweigh the potential profit. In recognition of this issue, President Obama signed a law in 2012 that extended by five years the amount of time pharmaceutical companies have exclusive rights to sell antibiotics without competition from generic brands. Although he says new antibiotics are necessary, Dr. Scott Weissman, assistant professor at Seattle Children's Hospital, also says that in order to fully address the problem, "the new antibiotics will have to be introduced in a setting where antibiotic stewardship practices are in place." - Take the full dose of antibiotics prescribed to you, even when you start to feel better. If you don't, you risk enabling some of the bacteria to develop resistance, survive and thrive. - Don't take other people's antibiotics: A physician prescribed a type and dose specific to your infection. "Antibiotics are for a course of therapy, and you might feel better, but by not completing the course, you're lowering the chance of not killing off the infection," says Mariesa Durrant, a clinical pharmacist at Providence Sacred Heart. "That affects your current infection, as well as ones in the future." - Don't expect an antibiotic from a physician. Some infections, such as viruses, can't be treated with antibiotics. Taking them unnecessarily only exacerbates the antibiotic resistance problem and won't help you. - Wash your hands: It helps stop the spread of bacteria. - Get a flu shot every year. Even though the flu is a virus, which is not treatable with antibiotics, contracting it can leave you vulnerable to bacterial infections. Antibiotics given to animals contribute to the problem of antimicrobial resistance, but according to Dr. Guy Palmer, Regents Professor of Pathology and Infectious Disease and Senior Director of Global Health at Washington State University, this is a much bigger problem throughout the rest of the world than in the United States. Before the U.S. Food and Drug Administration started regulating the amount and type of antibiotics administered to food animals, cows, pigs and chickens in the U.S. were given feed that contained antibiotics, because they help stave off infection and help the animals grow. The animals then became a breeding ground for antibiotic-resistant bacteria. Those germs could infect humans through improperly prepared meat. Fertilizer and water containing trace amounts of animal feces also could infect humans. In 2012, the FDA instituted guidelines requiring sponsors of animal drugs to remove packaging labels on feed that say antibiotics promote animal growth. In June of this year, the FDA finalized a policy that requires veterinarians to authorize the use of antibiotics in animals. "That's a fairly major change," Palmer says, but he adds that changing the amount of antibiotics given to animals in the U.S. is a small fix for a much larger problem. The practice is still rampant in other countries, especially in the rural areas of India and China. "The change puts the U.S. in a leadership position," says Palmer, "but it's naive for anyone to think this is the solution."